Expert Authors Beware: Don’t buy into these instant article writers, rewriters or wizards that falsely showboat that they fooled us once into accepting their PLR re-written articles. The scam works like this: They use their PLR rewriter software to submit articles to us, we review them and if they were sneaky enough to get us to approve them; they then take screen shot captures proving that they fooled us once so they can go on to fool other people into thinking they can fool us. Unfortunately, they have forgotten that it’s a very small planet and that usually within a few hours to less than 2 weeks time; we purge their articles and then ban them from the site. Want proof that their methods fail? Just go look at any of their examples and try finding their articles on our site. The last guy who did this made the links in his EzineArticles acceptance emails active on his public sales letter page but we caught him in 6 hours. The next guy (who should know better) to try and scam us today was caught in 5.5 days… but this time, he took screen shots of his EzineArticles acceptance emails because he knew we’d ban or remove them shortly. In addition to human article review, real-time and daily/weekly automated cleansing suspect-content identification, we receive reports daily about questionable author activities that are then investigated…so I can assure everyone that if you engage in article rewriting or PLR article submissions, it will not be a long-term relationship. One of the “disadvantages” of being so well known, so popular, and so wonderful is that others will continually try to hurt you. Kudos to you and your team for keeping up with all of this. 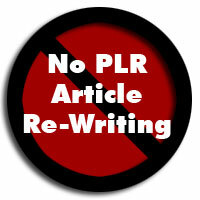 Whilst I have actively promoted the use of well written PLR articles for niche websites (preferably modified heavily by hand), I have also been quite outspoken against their use for article submissions. One of my favorite tricks with PLR articles is to pay a professional translator to translate them into another language. And here I am thinking how after offering free editing service to a couple of friends I am glad they did not take me up on the offer because I really do not want to do it and felt it a distraction to my own mission and purpose, though indirectly related. Now I find rewriting other people’s work is the passion of some. :-) Surely there are no limits on artistic expression! Original well-written content is the only way to go. How else do you establish yourself as an authority on a subject, much less get people to trust you. Helping others achieve their goals by providing someTHING that is truly of value is the only way to succeed in any venture for the long term. It seems with all the cheaters, short cut trickery and other things people do, that if they would apply the same brain power and a little hard work ethic, they could go completely legit for about the same amount of time and energy and I have 10,000 reasons why I believe this too. What’s worst about these scam artists is that there really is an easy way to quickly write quality articles from scratch. I know. I teach it to thousands of people on my list regularly. What’s more, they actually use these strategies to write quality articles and build their own lists.